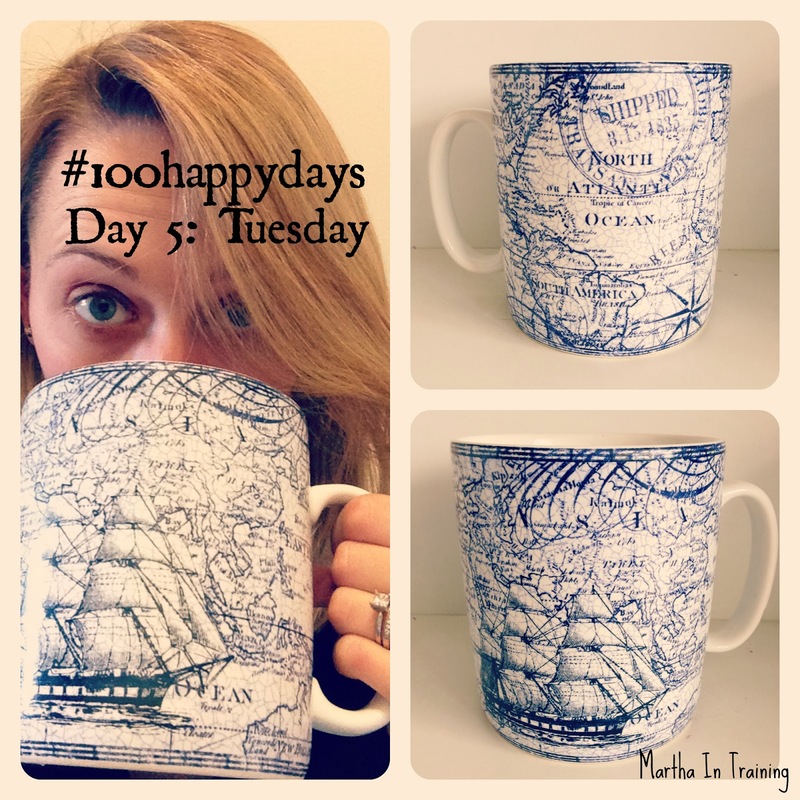 As I mentioned last week, I embarked on the 100 Happy Days challenge. Week one went well, although sometimes I felt like I was picking something that made me happy too early that day, or reusing something similar from a day before. I've found I'm identifying multiple things to snap a picture of and then having to narrow it down to one to be my happy thing for the day. The more things you have to be happy about the better. John and I went out for dinner with our good friends (faces blocked out of respect for their privacy) who are expecting a baby in July. We feasted on Indian food, a favourite of mine. Besides being able to catch up over delicious food, the thing that made me happiest was that upon greeting each other, as we took our jackets off, my friend asked, "are you wearing stripes?" I originally meant to take a picture of my feet and John's feet in bed with the sunlight coming in through our bedroom window while we lazed in bed, but I didn't want to ruin the moment. Many things to be happy about on Saturday - a quiet day + dog walk with my best friend and her pooch, wine with my sister, a visit with some other friends in the evening. My main problem is that I enjoy the moment and forget to try and capture it, which isn't necessarily a bad thing. Look up the lyrics to 3x5 by John Mayer, one of my favourite songs. Day 2 is a delicious breakfast of leftover Indian food incorporated into scrambled eggs & more broadly representative of my love for breakfast. Another day to sleep in and wake up to a full pot of coffee. John and I had brunch with my best friend and her husband. I got the grand slam because, as previously mentioned, I love breakfast. I worked in the evening and I was quite thankful for a quiet shift that allowed for the nurses to sneak away between med times and providing care to watch some of the Academy Awards. I didn't want to post a picture from work because I'm always afraid somehow I will overlook something and break confidentiality of a patient. Day three was the first day I felt I repeated myself with a food picture. I was quite pleased with the way my homemade salsa turned out (1 pint cherry tomatoes, 1 onion, 1/2 jar of diced roasted red peppers in oil and handful of parsley all blended together) so I mixed it with some chicken and tossed it on top of some spinach. After an early morning visit to the vet (a one week check up post spaying), Reese was okayed to play off leash in the park again. My happiness was seeing how happy she was to be able to leap and bound through the snow at full speed again, to play with other dogs, and to finally let out that built up energy. After working my first of 5 night shifts this week I was very happy for my giant mug of coffee. I find that the first night is always the hardest, as I only really do 5 a month now and they are all in the same week. This means I get a 3 week vacation from nights every month which is fantastic but also means that that first night back is going to be a long & sleepy one. After a solid 4-ish hours of sleep this morning I was up to take the dog to the park. And though I intended to come home and try to take another nap before heading back to work, I instead did the dishes and made myself breakfast ... and a pot of coffee. Early Wednesday morning I was tired at work, waiting for 7:30 am to roll around, but I knew I was going home to sleep in my own bed for the next two nights. In the wee hours of the morning, the quiet ones on those lucky nights where everyone in the house is sleeping, I made myself some raisin toast and read through the paper from the day before. Quiet moments before the morning rush. My full day off. I woke up at 11:30 am after catching up on the sleep I'd been deprived of during my night shifts and resigned myself to a lazy dog of dog walks, tv shows (True Detective!) and a luxurious bubble bath. I love baths. And I hadn't taken the time to lounge in one for awhile so Thursday's was like being at the spa. It's amazing how something so simple can put you so at ease. And that wraps up week one of 100 Happy Days. Join in if you haven't already and let me know what some of your happy things are.